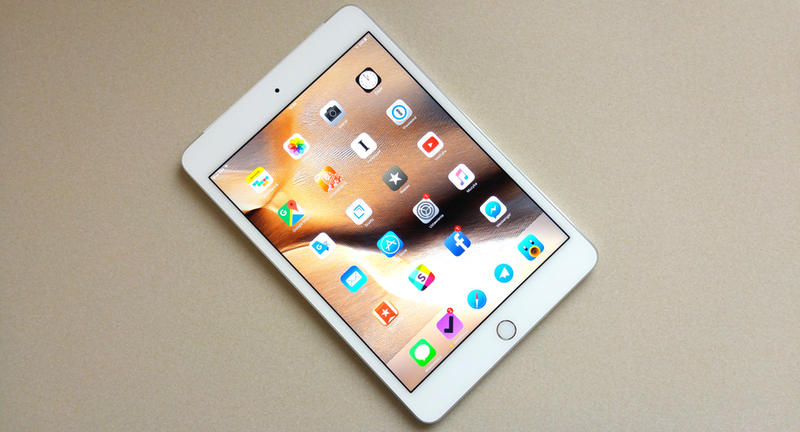 Last year’s release of the iPad mini 3 let down many users and fans of this smaller Apple tablet. Except for a screen with a wider color gamut and the addition of Touch ID, it offered no other improvements. The future of smaller iPads seemed rather dim, and it appeared that bigger iPhones met the needs of users who wanted a device with a bigger screen. Was it an end to the iPad mini product line? Not at all! The latest model — the iPad mini 4 — is even lighter, thinner and faster, and I know there is no smartphone that could replace it. Those change in form factor are noticeable instantly when you grab the device with your hand. Maybe making it thinner (from 7.5 to 6.1 mm) doesn't matter that much, but the reduced weight (about 30 grams) does! The iPad mini 4 is incredibly light. It is hard to believe that the Apple engineers were able to create a product with such a great size and weight ratio. Talking about numbers, it is worth mentioning that the iPad mini 4 is about 3.2 mm longer than its predecessor — that’s long enough that it can cause some problems when trying to use cases for the iPad mini 3. One thing hasn't changed - there is still a Home button with first-generation Touch ID. The resolution of the Retina display also hasn't changed, still at 2048 x 1536 pixels with 326 pixel per inch density. The screen did get new antiglare and oleophobic layers. The antiglare feature proves its worth while working with hard ambient light (especially daylight), reducing reflections and turning them into a light purple glow that is not a problem. Unfortunately, the oleophobic layer only slightly reduces streaks and fingerprints on the display. The screen itself is bright enough, with crisper colors compared to the previous generation. However, those who have had a chance to work with the newest OLED screens may not be satisfied with the reproduction of black color. The only thing I can really complain about is the gap between the screen and front glass, which is bigger than in the iPad Air 2. The heart of the iPad mini 4 is a modified dual core 64-bit 1.5 GHz A8. However, due to the 2GB of RAM and improved GPU, it is closer to the A8X than to the processors used in the iPhone 6 and iPhone 6 Plus. The new system on a chip was manufactured by TSMC using a 20 nanometer process and it is about 30% faster with the GPU being 60% faster than its predecessor. The most noticeable improvement is 2GB of RAM. You can have more apps or Safari websites open without needing to reload them every time when you return to them. While taking photos with the iPad isn’t probably the best idea, the relatively small size of the new iPad mini makes using it as a camera quite comfortable and easy. There is an 8 megapixel BSI matrix iSight camera with an f/2.4 five element lens on the back. The camera can record 1080p video at 30 frames per second and slow motion video at 120 frames per second. As you’d expect, the front-facing FaceTime camera is less impressive with its 1.2 megapixel matrix. It can record 720p videos. The iPad mini 4 is available in three colors - silver, gold and space gray. As usual, there are also both Wi-Fi and Wi-Fi + Cellular versions. The smaller form factor forced Apple to use a battery with less capacity compared to the previous model. It is a 19.1-watt-hour lithium-polymer battery, while the iPad mini 3 had a 23.4-watt-hour battery. Despite that, the number of hours the device will work on a single charge hasn't changed — it can still last for 9 hours surfing the web on a cellular network thanks to the much more power efficient iOS 9 and A8 processor. The iPad mini 4 is an excellent device that gave me back my faith in smaller tablets. Its convenience, size and weight play great with the screen size that is perfect for daily use. Thanks to the new design, the iPhone won't totally replace my iPad, even if I do use it more often.